We have a none refundable policy. We will charge your creditcard as soon as we receive your booking with the outstanding amount. In case of insufficient funds, your booking will be canceled. Please do not book, if you not agree to this policy. Please, confirm your booking 3 days before the arrival. 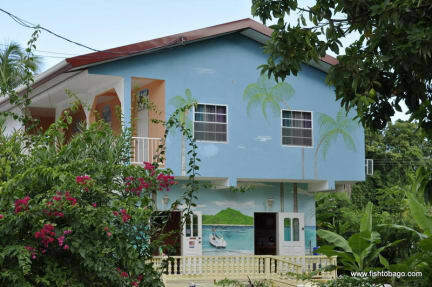 Our hostel is located just 5 minute walk from the Buccoo Beach. Restaurants, bars, local food stands, groceries, gym, bus stop, car rentals, casino and a golf course you'll find within the walking distance. We'll be happy to give you an orientation around Buccoo! 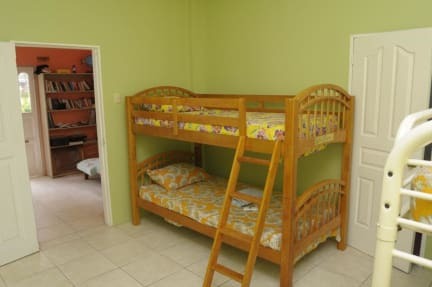 We offer accommodation in dorm room (with 3 bunk beds) and private rooms (with queen size bed). All our rooms have private bathrooms, screened windows and AC. 4 private rooms are available with private living areas and kitchens. There is fully equipped shared kitchen and a lounge room with a small library. We have wireless Internet connection for a on time fee of 50.00 TTD on Arrival. Aside from the veranda with the dining area, you will also find a barbecue corner and many sunbathing spots in our front yard. For our guests we prepared many special offers that include boat trips and cruises, fishing, snorkeling scuba diving, dolphins watching, island tours and many, many more.